Bottom photo (L-R): Mun Choi, Latha Ramchand, Chris Chinn, Patricia Okker, Bob Sharp, Christopher Daubert, Don Cupps and David Steelman (Chair, Board of Curators). Top right photo (L-R): Michelle Brooks, David Braun, John Walker and Jim English. 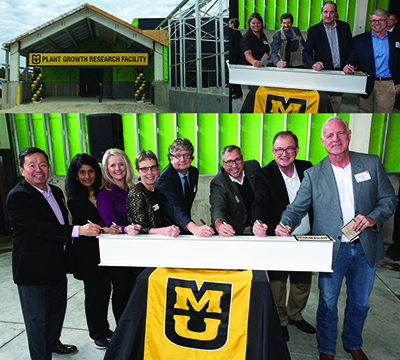 On Saturday, September 29th a “Topping Off” ceremony was held to celebrate a milestone in the construction of the University of Missouri’s new Plant Growth Research Facility. The new facility will include nearly 23,000 square feet of greenhouse space in three ranges, and more than 9,300 square feet for controlled environment plant growth chambers and seed drying and storage. Following the program, all attendees were invited to participate in a beam signing to commemorate the event. Construction began in September of 2017. Completion is anticipated in Spring 2019. A Topping Off ceremony is traditionally held when the top-most structure of a building is completed. An evergreen tree, symbolizing good luck, continued growth, and a safe construction environment, is often included in Topping Off events and participants of the celebration received a sapling to take home. More photos of the event can be found on the IPG Flickr page.